Peter Racine Fricker is one of those English composers whose music achieved brief recognition in and around the middle of the last century before giving way to the efforts of composers who remained in the UK and managed to distance themselves from the prevailing mood of austerity rather better. It seems that Fricker steered a middle course somewhere between late Bridge (influenced by Hindemith and Berg) and contemporaries such as Britten, Tippett, Rawsthorne and Alan Bush and ended up falling well and truly between two stools. Whilst his music is often acerbically dissonant it has a tonal basis and this was probably enough to make him unfashionable with the trendies of the fifties and sixties – albeit without any elements that would necessarily endear him to a wider musical public. As a result, posterity has been unkind and his music, rather like that of Bush, has never found its way into the standard performing repertoire. In the course of his career he managed to produce a fair body of compositions, including five symphonies and two concertos each for piano and violin. The present disc give us his complete music for string quartet. Fricker’s first attempt at writing a quartet seems to have been during his military service in 1943, when he produced a mystic Adagio and a gritty Scherzo that may have been intended as the middle two movements of a formal string quartet. These two pieces are usefully included as a post-script and constitute, to my mind, the most approachable music on the disc. The early recognition the composer achieved came about largely as a result of being awarded the Koussevitzky Prize in 1949 for his First Symphony, Op.9. This gave him a useful launching pad at exactly the right time – just as the Festival of Britain was being planned. His First String Quartet, Op.8, had recently been completed and (as the booklet puts it) “benefitting from the symphony’s brilliant afterglow” it was taken up by no less an ensemble than the Amadeus Quartet – to considerable acclaim. This quartet begins with an idea that could be a distant cousin of the opening of Britten’s First Quartet – although the effect is much less memorable. Whilst not atonal the music that follows evokes the grey, post-war atmosphere all too successfully for me and I’m afraid I can’t express much enthusiasm for it. There is only one movement but this is effectively divided into seven contrasting sections, usually switching between intense slow and fast episodes. Oddly, the booklet notes suggest that a “three-movement form may be felt (such as Bartók employed in his fourth and fifth quartets)”. I didn’t detect this – and Bartók’s fourth and fifth quartets are both in five quite distinct movements (albeit with an “arch” form) but we’ll let that pass. Whatever my reaction to the music the Amadeus Quartet obviously liked it for they commissioned a second quartet, which Fricker began in 1952, completing it in early 1953. This one is in three movements which are “within friendly distance of tonal reference”. The second movement (Molto Allegro) starts with a memorable pizzicato episode which, after the fairly sombre opening movement, probably went a long way to gaining the quartet a warm reception – at least temporarily. The last movement is a fairly bleak Adagio that apparently recalls material from the first movement – although that is hardly obvious to the casual listener. Whatever its merits it seems nobody was ever sufficiently keen to commission a third quartet and Fricker’s publishers went as far as to discourage composition of another quartet. Fricker’s career flourished in the fifties and he succeeded Michael Tippett as Director of Morley College in 1952, holding the position for twelve years. His Third Quartet did not appear for as long as twelve years after he left Morley College, by which time he had become visiting professor of music at the University of California in Santa Barbara. Apparently, Fricker was inspired to write the quartet (without commission) after hearing Elliott Carter’s Third Quartet. The compositional process was protracted and frequently interrupted by the need to give priority to other works, notably the Fifth Symphony. The end result is a five-movement serial work, typical of Fricker’s late compositions, and it is divided symetrically around the Adagio central movement. I found the short and jittery second and fourth movements most interesting, the former with a jagged triplet motif - which becomes a slightly more memorable spiccato motif by the fourth movement. The fifth movement consists of a Presto with eight variations and an extended pulsing coda and it gets quite exciting. The piece remained unplayed until Fricker managed to get the Chilingirian Quartet to play it at the 1984 Cheltenham Festival (a radio recording of which I possess). After that it seems to have had no champions until the Villiers Quartet made the present recording. The performances of the Villiers Quartet are slightly gruff but suitably polished, with no distracting foibles and excellent intonation. I thought I had a copy of the Amadeus Quartet’s Argo recording of the Second Quartet available for reference but, unfortunately, this was not the case and that performance does not seem to be available to download. Comparison of the performance of the Third Quartet with the Chilingirians’ recording of it reveals very similar speeds and few real differences although the accompanying violin “scurries” in the first movement are somewhat more distinct in the Chilingirians’ hands – the Villiers players tend to bury them. On first hearing at a relatively low volume I thought the recording was clear but the stereo soundstage seemed a bit narrowly focused. Subsequent hearings at a higher volume, however, demonstrate a perfectly adequate spread – albeit not quite as expansive as that of the Chilingirian Quartet. Interestingly, the BBC engineers of 1984 managed to produce a splendid recording at least as good as the present very satisfactory effort. The informative and very readable booklet notes are confined to two pages, according to the usual Naxos house style, regrettably in very small print. 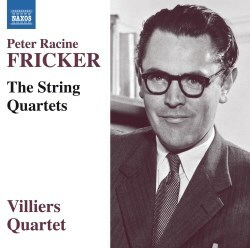 I can think of rather more congenial music for repeated listening but, if you like acerbic twentieth century quartets, this fine disc gives us comprehensive coverage of Fricker’s quartet offerings and is to be welcomed.